Catholic church in Santa Bárbara de Samaná. The town of Santa Barbara of Samaná sits on the Samaná Peninsula which came first into written history on 13 January 1493, when Christopher Columbus made here the last stop of his first voyage to the New World. He landed on what today is known as the Rincón Beach, where he met the Ciguayos who presented him with the only violent resistance he faced during this visit to the Americas. The Cigüayos had refused to trade their bows and arrows that Columbus's pathfinders wanted. In the ensuing clash, two Amerindians were wounded. Because of the Ciguayos' use of arrows, the Admiral called the inlet the Bay of Arrows (or Gulf of Arrows). Columbus took on board four natives to show in Spain, but only one survived. For most of the colonial period, the Spanish did not settle here, opening the place for runaways and privateers. In 1756, under the direction of Spanish governor Francisco Rubio y Peñaranda, families from the Canary Islands founded the village and named it, Santa Bárbara de Samaná. It was named Santa Bárbara after the Queen Bárbara de Braganza, wife of King Ferdinand VI of Spain. They also settled on the other side of the bay, in Sabana de la Mar. As part of the Peace of Basel's accords, the entire Santo Domingo colony passed over to the French in 1796. But in 1807, a small force from the British Royal Navy raided Samaná and turned it back to the Spanish creoles who were fighting against the last French bastion on the island. In 1822, after the Haitians had occupied the entire island, a French vessel threatened a renewal of the French-Haitian hostilities. After a small encounter, named "the Samaná Affair," the French retired taking with them various families that had resettled here after the Haitian Revolution. The main economic activities of the municipality are tourism, agriculture and fishing. The largest boost to local economy takes place in Jan-March with the annual migration of thousands of North Atlantic humpback whales that come to the Samaná Bay to give birth. Samaná is the center of the country's tourism during these months. Hanley Ramírez (b. 1983), baseball first baseman for the Boston Red Sox. Fernando Rodney (b. 1977), baseball pitcher for the Seattle Mariners. Yordano Ventura (1991-2017), baseball pitcher for the Kansas City Royals. Théodore Chassériau (1819-1856), a French painter, was born in El Limón in 1819. ^ a b De la Fuente, Santiago (1976). 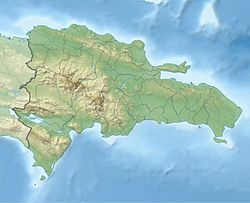 Geografía Dominicana (in Spanish). Santo Domingo, Dominican Republic: Editora Colegial Quisqueyana. ^ Thompson, Alvin O. Flight to Freedom: African Runaways and Maroons in the Americas. University of West Indies Press. p. 181. ISBN 9766401802. ^ Exquemelin, Alexandre Olivier (1911). The Buccaneers of America. Allen, Limited. pp. 19 and 263. ^ Rodríguez Demorizi, Emilio (1973). Samana: pasado y porvenir. Sociedad Dominicana de Geografía. ^ Davis, Martha Ellen (2007). "La historia de los inmigrantes afro-americanos y sus iglesias en Samaná según el reverendo Nehemiah Willmore" (PDF). Boletín del Archivo General de la Nación (159): 237–245. ^ "Climate Normals for Samana 1961-1990". National Oceanic and Atmospheric Administration. Retrieved May 12, 2013. This page was last edited on 3 May 2018, at 17:07 (UTC).